A new Facebook application will allow fans of NBC's "The Voice" to vote for their favorite artists through their Facebook profiles, now known as their timelines. "The Voice" coaches surrendered control to the people of America Monday as the talent show shifted to a new voting round. While the contest's four coaches—Blake Shelton, Adam Levine, Christina Aguilera and Cee Lo Green—will continue to weigh in, the public will have considerable say over which of the 24 remaining competitors will have his face plastered on the cover of a chart-topping album. Shelton and Aguilera's six students got first dibs on the stage Monday night. For a live show, everything went remarkably well: No falling, no tripping, no painful notes or lyric botching. And the coaches tended to agree. "This is not going to be easy," Shelton said as the show began. "It's hard to make a decision." 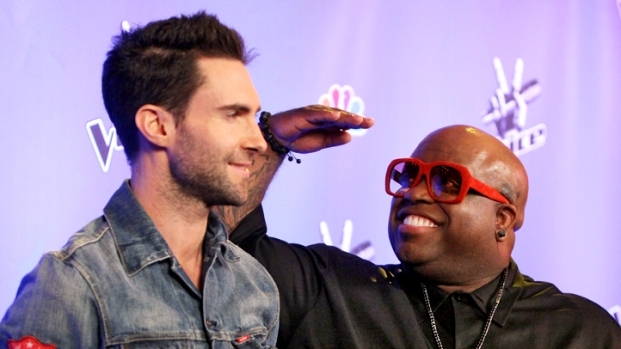 'Voice' Judges Have a "Friendly Rivalry"
Adam Levine and Cee Lo Green chat about coaching the contestants on "The Voice." If they could each steal one contestant from another coach, who would they take? While each performance was professional, none was particularly mind-blowing. Jermain Paul, the 33-year-old career background singer who's one of the most talented acts in the line-up was stunted by a poor song. His R&B power was bound by the confines of Bon Jovi's "Living on a Prayer" — a choice blasted by Aguilera and weakly defended by Paul's coach, Blake Shelton. "The girls liked it," Shelton offered. Jesse Campbell, another top vocalist— arguably The top vocalist—had a solid performance, but nothing that came close to his audition and gut-busting battle round duet. RaeLynn, the apple of Shleton's eye, performed a good-enough country interpretation of Maroon 5's "Wake Up Call." Everyone complemented the Texan teen on showing an edgier side than she did during her sweet acoustic audition. But the compliments were all about improvement and potential, with one exception. "I just came from the Country Music Awards last night," Shelton told her. "You're what everyone talks to me about already. It excites me to know that Nashville is already behind you." The apple of Christina's eye, Moses Stone, perplexed the other judges who weren't sure how to assess his rap performance on the basis of voice. Aguilera, who spent his entire "Stronger" set dancing in her seat, raising her arms above her head and mouthing the lyrics, snapped back and explained that his performance went over the other coaches' heads. Aguilera's Ashley De La Rosa, Chris Mann and Lindsey Pavao entertained the crowd with all the requisite bells and whistles—interesting costumes, stage lights, smoke and dancers. But none was exceptional. The same was true for Blake's other pupils—Charlotte Sometimes, Erin Willet, Jordis Unga and Naia Kete. Whatever votes are cast (via phone call, text message, iTunes download and new Facebook app, which debuted this week) won't be tallied until polls close tomorrow at 10 a.m. ET. The three lowest ranking contestents will then sing for their lives on Tuesday (9 p.m. ET). The coaches will then drop the ax on the weakest of the three—a threat that might inspire a little more gusto.